No problem, send that stuff anyway, it would be great to see the shelves before and after the shipping of the magazine copies! So… do you confirm me that you personally ship each copy of the mag? Yes. I confirm your suspicion that I send all the copies of Blow Up. And that I put them in place… and that I also do the graphic layout of the mag and I take care of all the contacts with the typography, I go to the accountant… I confirm that I am completely alone, apart from those who write and send the articles via email. However, the “before and the after the shipping” pictures is not a bad idea! 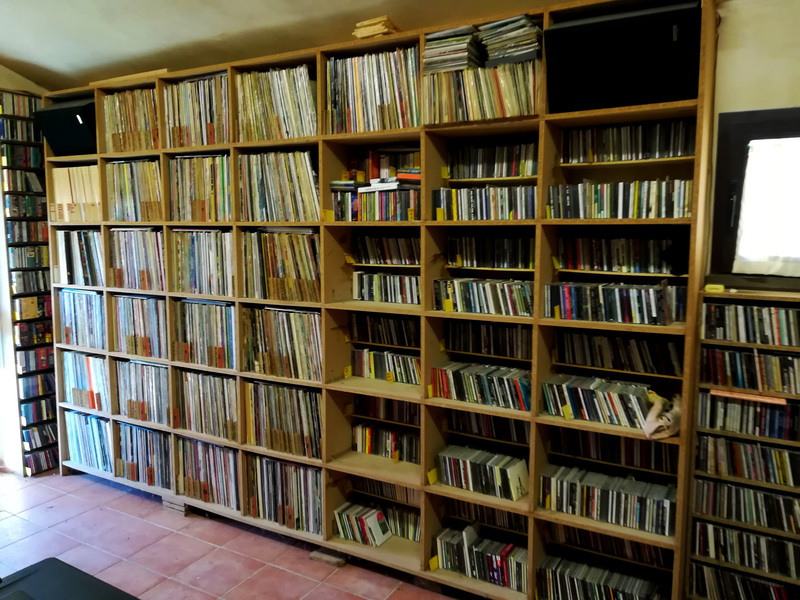 Stefano Isidoro Bianchi room of records (before shipping all the Blow up magazine copies – January 2018 issue). It really seems that your house and your life are overwhelmed by the music. 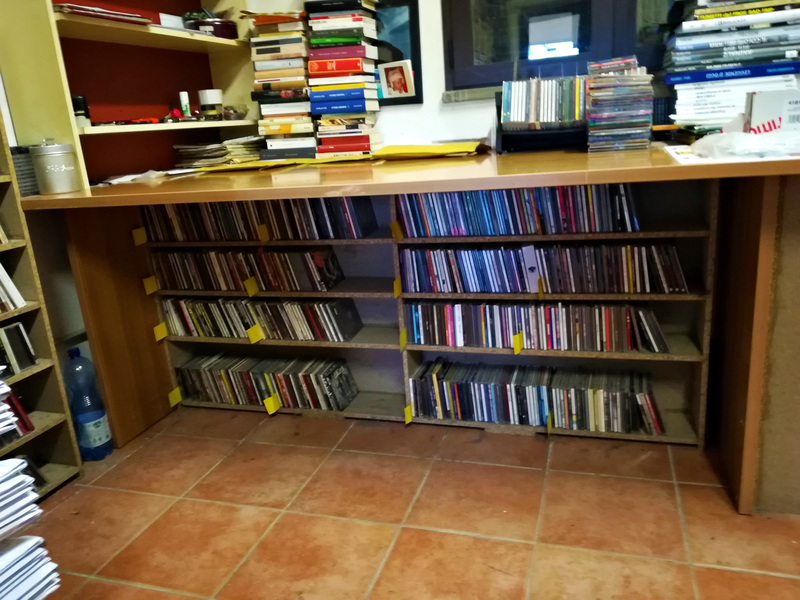 There is not a single corner without records… Being you the director of one of the main musical magazine in Italy, I’ve asked myself many times WHEN do you find time to listen to what you feel like, not what you have to. I mean, I suppose you receive thousands of promos, and you have to review them and to prepare yourself for the interviews and so… Is there any moment left for the ‘real’ listening to what you want to listen in that specific moment? Actually not only by music, you haven’t seen books and comics… Well, I must confess I haven’t much time to listen to what I’d like to; fortunately I have so many contributors in Blow Up who can do the work we have to do with promos, so I can keep myself enough free time to write articles and books more than reviews. 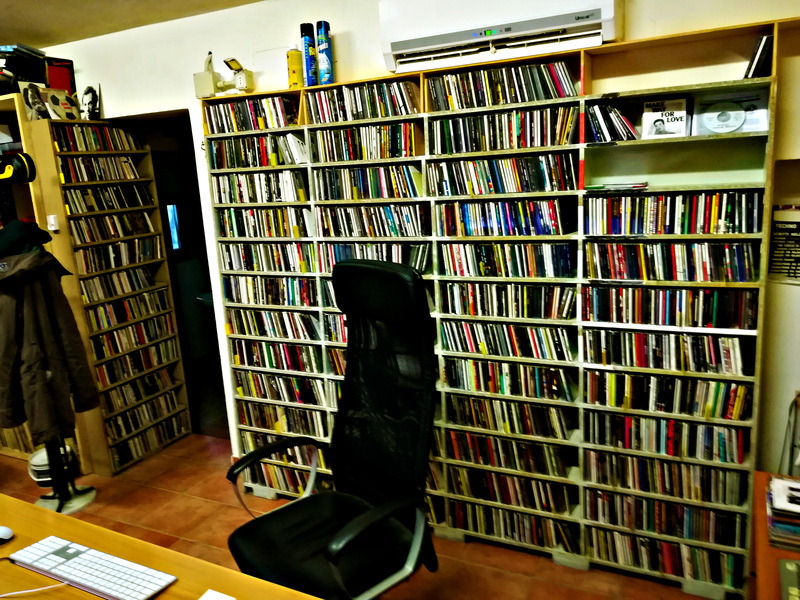 But for sure the simple pleasure of listening to music, well, has partly gone with the business. I see… so, what’s the last record you listened for pure pleasure? Well, there are lots of them! I mean, fortunately there are many new records that are very good, so it’s often a pleasure also to listen and review new records! It’s rare, I must admit, that I play a record just to listen to it; when I decide to write an article or start a book, I decide for a band or musician I love, so it’s a pleasure listening again to records I don’t listen to since many years, for example… The most recent have been the records of Gogogo Airheart and Panoply Academy, and above everything else all the records of Mayo Thompson for my book on the Red Crayola / Red Krayola. Moreover, I don’t want to be indiscreet, but… I’ve noticed what can look like female boots (‘shiny boots of leather’ maybe), and female shoes. If you’re not wearing that, is the person living with you appreciating music as you do? Or at least a bit of how much you do? Ah ah, sure! She’s my wife, and she loves many – not all, I’d say – of my records. Ok, I see… so which is the favourite music of your wife? Mmmh… I’d say the music we listened to when we were young: Joy Division, Gang Of Four, P.I.L., Talking Heads, Patti Smith, later REM, Nick Cave, Depeche Mode, then Tom Waits, Nirvana and so… In general very few bands before 1976 and very few bands of ‘classic rock’. Funny! Many names would be very close to my favourites too! I think I could get along with your wife! So she sort of ‘cuts off’ stuff before 1976. What about you and the non-rock oriented music? I’m asking myself if you also like some ‘classical music’, or contemporary… Mozart, Wagner, Varèse, Bartók… Or you just love “rock and other contaminations”, as is written on Blow Up cover? Well, there’s another question I have in mind watching the stuff you have: do you keep the promos? Or you trash most of them? Or you just send them around to the Blow Up collaborators? 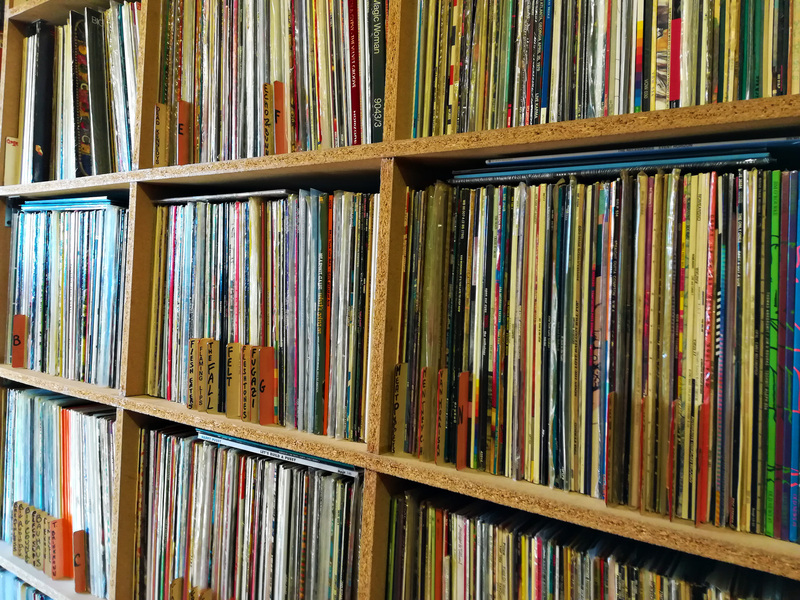 So I need to ask you: which is the last record(s) you bought!? I’m sure is nothing really recent, have I guessed? Oh no, I buy old records, new records, everything I feel, really no difference. The last ones by now, January 2nd 2018? Here they are: “Lost at Last Vol. 1” by Langhorne Slim (new) and “Live at the New Morning, Geneva, Switzerland, 18.05.1989” by Spacemen 3 (old). 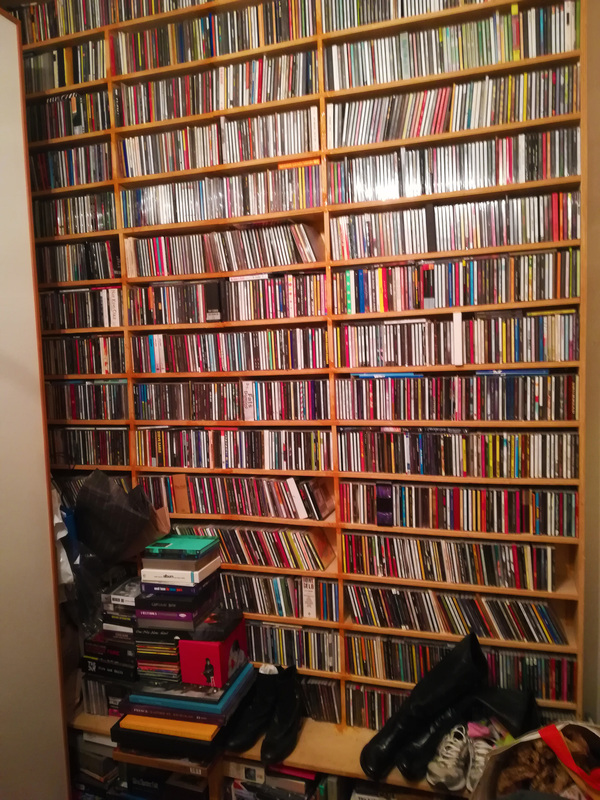 Yes, they are put in alphabetical order without distinctions of category, kind, or age (save the prewar folk-blues-country and few other exact genres). But some name whom I have many records of I keep aside. What do you keep aside then? Among the ones that you reviewed on BU, I remember a passion for Peeesseye/Chris Forsyth, a moving article about Bruce Springsteen, a strong appreciation for any stuff that Bruno Dorella does… what else? 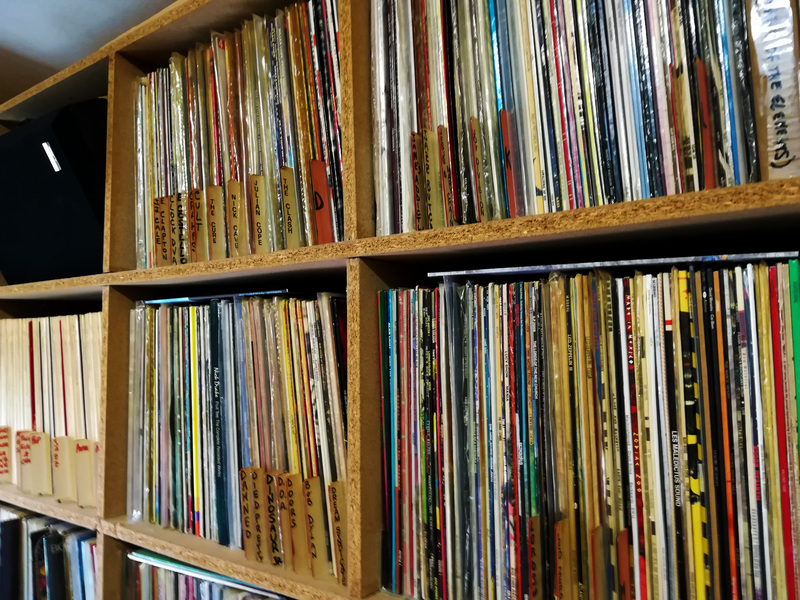 They are so many… But with “I put them aside” I meant that they have a sub-division for themselves in the alphabetical order of the vinyl records, i.e. Husker Du or R.E.M. or Springsteen or Thin White Rope or Spacemen 3 or whatever. I didn’t mean that they’re in a different shelve. For some reason I found strange the presence of the blue plastic bottle on the ground. 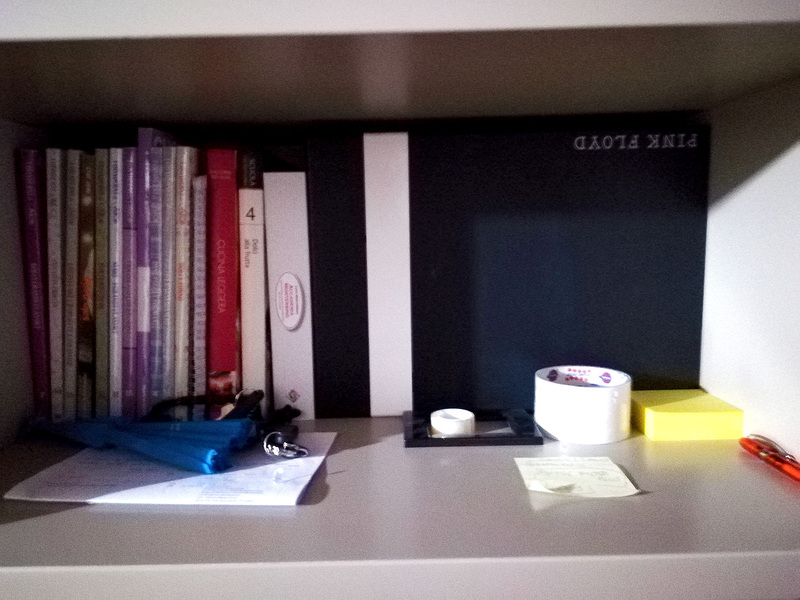 Not on a table… at a first sight, I thought that that room can be the shelter of a hidden person. Our someone is kidnapped there. Or maybe there’s just a much simpler reason for that bottle on the ground? 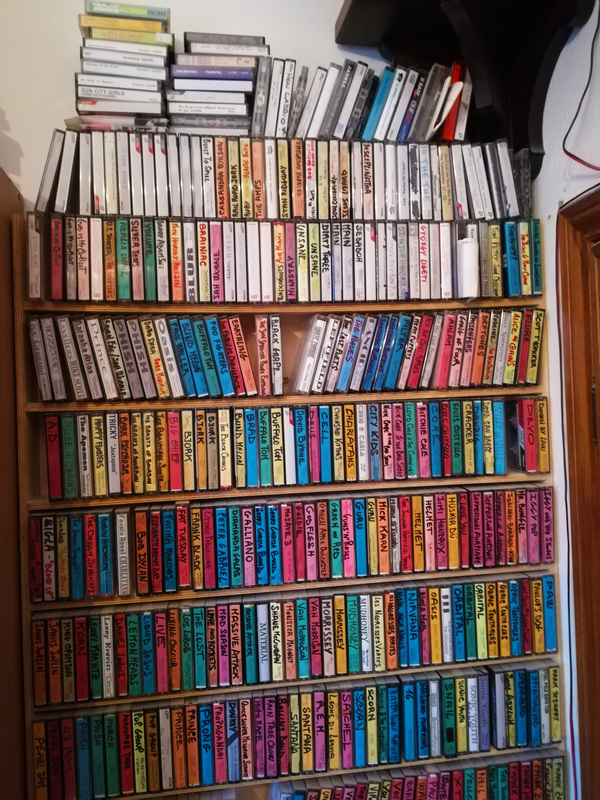 You even have tapes. Old tapes. Tenderly coloured and all in alphabetical order too. Can you tell me more about them? Here is a difficult one, that I dared to ask also to your collaborator Vittore Baroni time ago, who also has thousands of records. Do you think it’s possible to tell a favourite ONE? He obviously said it’s impossible, but at the end, he elected “Eskimo” by the Residents. It’s really so difficult and at last I think we have to choose a record we particularly have in our heart. Well, I’d say “Nebraska” by Bruce Springsteen. Ah, ok, Nebraska, so it’s the one you had also on your magazine’s “RPM” section. I well remember the end of that article, very moving, with something about your father. Anyway, who did transmitted this passion for music to you? Usually is a bigger brother, or one of the parents (mother in my case, for instance), of a friend… Or maybe it all came from yourself? Absolutely no one. Neither my parents or my friends were educated to music, no one I knew when I was a kid listened to anything but the mainstream music. Music was for me a way to escape the world I was living in, a place where I could fly and build a world of mine under the covers in my bedroom. I dreamed of London, I dreamed of New York. I dreamed of Lou Reed and the wild side of life, I dreamed of Jim Morrison and poetry, I dreamed of Bruce Springsteen who was my older brother, I dreamed of Ian Curtis who dared to do what I dreamed to do and had no guts to do. Exactly the opposite of the quiet sunny Tuscan countryside I was livin’ in. 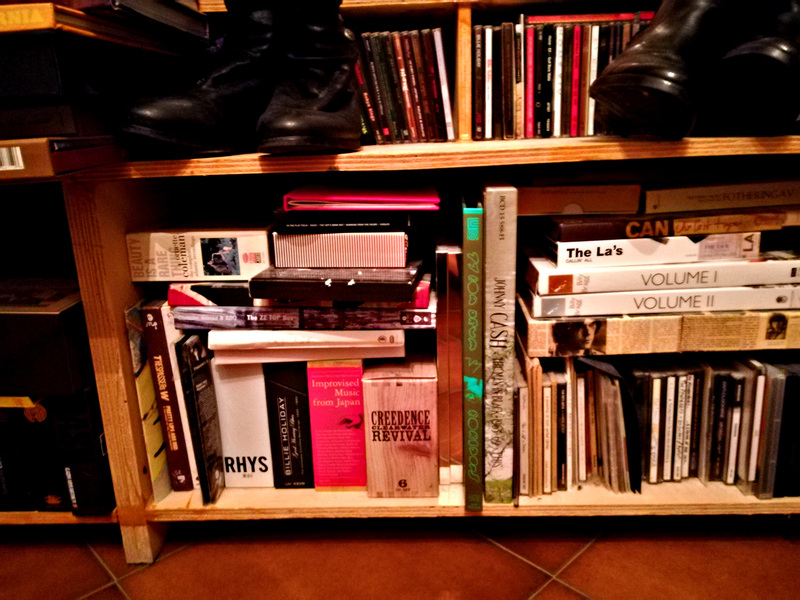 Rock music ruined and saved my life, and I mean it (even if I absolutely dislike the old old old rhetoric of rock’n’roll that saves… I was saved also by books, so many books… but at 15 music is much more important than books, you know). 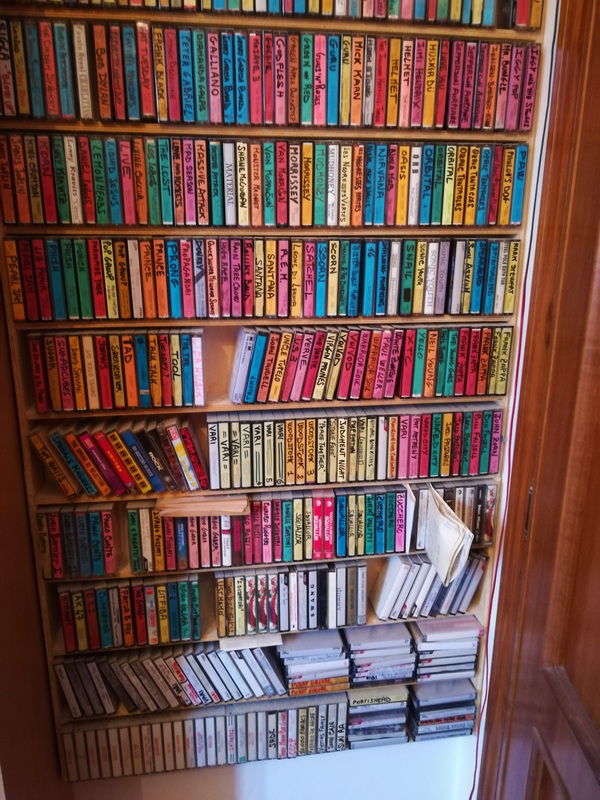 Stefano Isidoro Bianchi room of records (after having shipped all the Blow Up magazine copies (January 2018 issue). It seems that you love music so much but I can’t find any trace of you playing. Did you ever played an instrument in a band or alone? Did you ever consider to make music instead of writing about it? Well, I think I have touched a guitar once, and a drum set, and a saxophone. Just once in my life. 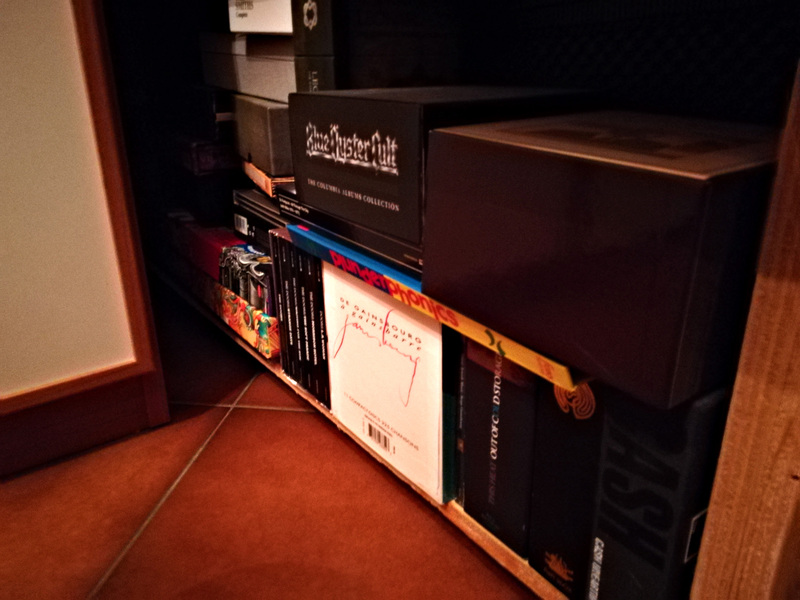 Never played anything. I’ve never dreamed of playing anything. I love writing. Nothing else. Stefano Isidoro Bianchi (Cortona, 1961) created the fanzine Blow Up in 1995, then the magazine Blow Up in 1997, and still does. 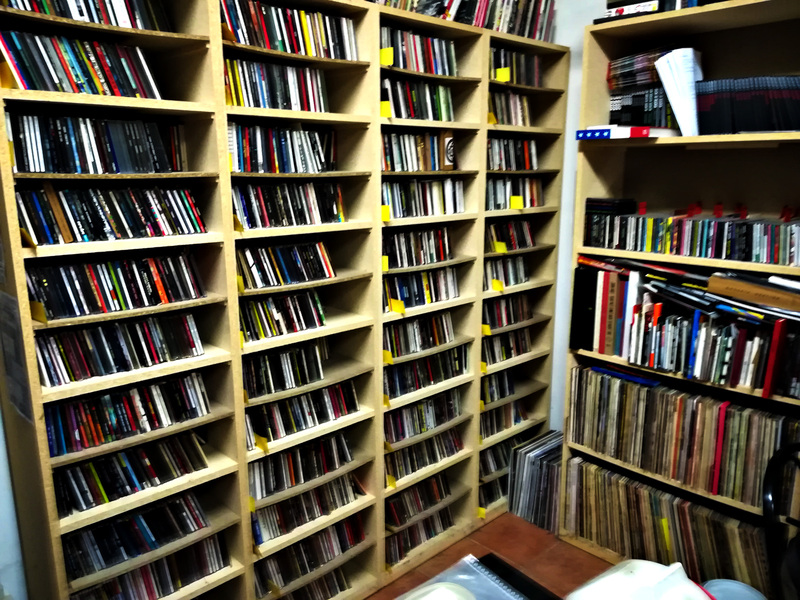 He owns nothing but about 35,000 records, about 3,000 books and about 19,00 cats.